Despite government claims, progress on reconstruction has been decidedly mixed. A year has passed since super typhoon Haiyan (Yolanda) wreaked destruction in the central part of the Philippine islands. While the government is claiming that its rehabilitation effort has been more than satisfactory, many communities are still in the relief phase. 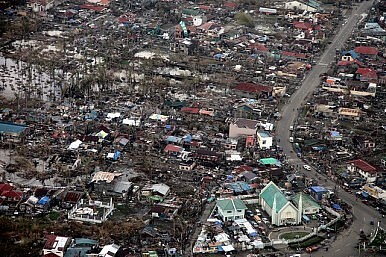 Haiyan was the strongest tropical cyclone to make landfall in history. It affected 1.47 million families, displaced 918,261 from their homes, and damaged 1.17 million houses in 171 cities, 14 provinces, and six regions. About 6,300 people were killed, 28,000 injured, and 1,000 are still missing. The number of casualties and fatalities may be higher still, since many bodies were never recovered in numerous unmarked mass graves. The government highlighted the positive performance of various agencies in providing assistance to typhoon survivors. Aside from distributing family food packs, livelihood grants, and cash transfers, the government insisted that it prioritized the resettlement of typhoon victims. Social Welfare Secretary Dinky Soliman is confident that tent or makeshift houses will be replaced by “safer transitional shelters” before 2015. “By year-end, none of the remaining survivors in all ‘Yolanda’-hit areas would be staying in tents and makeshifts,” she said in a press statement. Transportation agencies also reported that they have completed three airport and 14 seaport rehabilitation projects in the past year. Meanwhile, President Benigno Aquino III has emphasized that rehabilitation programs are on the right track. He mentioned that the Labor Department has provided jobs to 33,338 persons out of a target of 44,778. Aquino added that 12,843 individuals were given technical and vocational education out of a target of 24,535. Earlier this year, the government vowed to replace or repair 33,432 small fishing boats; so far, the government has already repaired 30,186 boats. The education department planned to rebuild 2,313 classrooms; of this target, 101 classrooms are finished and 1,095 are currently being constructed. Indeed, Haiyan-damaged communities are already moving forward, but even the president’s accomplishment report also revealed that the recovery is painfully slow in some areas. Ibon, an independent think-tank, used data available on the website of the Presidential Assistant for Rehabilitation and Recovery (OPARR) to show the disparity between the government’s commitment and actual performance. It pointed out that only 364 housing units were completed in Tacloban and Tanauan in Leyte province, compared to more than 500,000 houses were completely destroyed in the province. The Aquino administration is reeling from criticism that it has bungled the recovery work in the Haiyan-affected towns. Even the Commission on Audit has released a scathing report which questioned the Department of Social Welfare and Development’s “inefficient” utilization and distribution of funds and donations intended for typhoon survivors. Critics also pointed out that the government’s comprehensive rehabilitation plan was only signed by Aquino on October 29, or a few days before the first anniversary of the Haiyan disaster. This means that relief and recovery efforts in the past months have been undertaken by various agencies without a master plan to guide the activities. Politics aside, what is clear is that rebuilding the typhoon-ravaged towns in the Visayas remains a daunting task. Recovery must be followed by a program to revive the agricultural sector and other domestic industries. With or without the assistance of politicians, survivors are already rebuilding their lives. Many are grateful to local and international aid groups for their steadfast presence and even leadership in some relief centers. Nevertheless, the delay in the distribution of relief and the inaction of leaders in some instances are unacceptable. Survivors have every right to demand accountability from both the local and national governments.